The average British family is set to spend almost £800 on Christmas this year – and their American counterparts will themselves spend around US$950. That’s an awful lot of turkey and cranberry sauce to go with all those horrible socks for your uncle and those whisky stones for your hipster brother – not to forget that Rick and Morty version of Monopoly for your sister or that tartan scarf for your mother-in-law to go with all the other tartan scarves you’ve bought her every other Christmas. So what purchases can you make this year that provide more of that “real meaning”? Well, we’ve come to the conclusion that some of the best purchases you can make this Christmas may be on items that have a far longer shelf-life and far greater usability than Star Wars fruit and utensils. We are, of course, talking about books. Not only can they be read again and again, and invite us to explore new worlds and entire new universes, they also help us think differently about the world – and they teach us about wonderful new ideas. They’re also good for us, too. As this paper in the journal Science points out, reading literary works cultivates a skill known as “theory of mind”, which is described as the “ability to ‘read’ the thoughts and feelings of others.” So books make us nicer, basically. If there is anything more appropriate at Christmas, then, we certainly haven’t come across it. Hector Hugh Munro, better known by his pen name, Saki, was a master of wit and satire in the Edwardian era. Here, Daunt Books has reproduced four of his short stories that explore one the most dangerous aspects of Christmas: dealing with dull people. Saki expertly, and with an incredible precision of wit, deconstructs those most ghastly and perilous aspects of the holiday period, from being given unwanted gifts to writing thank you notes. Short and sharp enough to devour before breakfast on Christmas Day – and, crucially, small enough to fit in any size of present-filling footwear – this is an excellent stocking filler for anyone who pleasures in moaning about the festive holiday before getting into the swing of it all. 126 little books to choose from – each around 60 pages long – give you a wealth of options to explore. These extracts of wider classical literary works are sure to offer choices to meet all literary tastes. Authors include Karl Marx, Jane Austen, Jonathan Swift, Virginia Woolf, Friedrich Nietzsche, Plato, Caligula, Keats, Flaubert, Dostoevsky and Dickens. What’s not to love? Nominated for the Gordon Burn Prize, as well as the PEN Ackerley and the Bread & Roses awards, This is the place to be, by Lara Pawson, is one hell of a good read. Small enough to fit in your stocking, it still packs a massive punch in the proverbial “feels” as it moves with a delicate precision through personal anecdotes of the author, taking us from the market at Walthomstow to the harrowing experiences of war in Angola. There’s an immense honesty within this book that carries us through from start to finish – with each vignette or mini-story contained within it perfect for sharing together around a Christmas fire or over a large bottle of brandy. Most books that want to change us seek to make us richer or thinner. This book wants to help us to be nicer: that is, less irritable, more patient, readier to listen, warmer, less prickly. Niceness may not have the immediate allure of money or fame, but it is a hugely important quality nevertheless and one that we neglect at our peril. Produced by those wonderful folk at The School of Life – the same folk who gave us this lovely meditation on what literature is actually for – On being nice states that niceness “deserves to be rediscovered as one of the highest of all human achievements”. In the era of Donald Trump, Brexit, rising hate crime and geopolitical tensions, it’s a lesson we would do well to learn, whether it’s Christmas time or not. Speaking of people being nicer to one another, how about the latest iteration of the Corbyn colouring book? In a year that saw over 40% of the UK vote for the radical socialist and hope-filled policies of Jeremy Corbyn’s labour party – forcing the much-maligned (and malignant) Conservative government to sign a desperate deal with the terrorist-sympathising DUP – this book is a fine addition to the new canon of colouring books for adults. Designed by James Nunn, the new version invited you to “relive the excitement of #GE2017 over and over again.” To the colouring pencils, comrades! The Absent Therapist (TAT) saw Will Eaves shortlisted for the prestigious Goldsmith Prize, and you can see why. Technically described as a novel, this delightful little book will fit any stocking – but would also be a great find under the Christmas tree. A collection of mini-narratives, each with a precise tone and occasional touches of poetry, feature stories of artificial intelligence and musings on philosophy, of travel and adventure, and of course, family feuds – without which it simply wouldn’t be Christmas. Cousin to TAT, The Inevitable Gift Shop, is similarly groundbreaking and unique (as we’ve noted before). Described as ‘a memoir by other means’, it’s not at all plot driven. Rather, this work of collage brings together bits and pieces of memoir, fictional prose, poetry, essay and non-fiction. Interactive, funny, insightful and thought provoking in equal turns, it’s a perfect book to revisit time and time again. It now seems as though the shelves of all bookstores and department stores are full of these ‘adult children’s books’; semi-funny spoof versions of the books we grew up reading as children. You know the ones – “The Ladybird book of the Wife”; “Five go to an office Christmas party”; “Mr Tickle gets arrested for sexual assault”, etc. etc. The trouble with these books, however, is that they are so obviously part of a fad trend built up by the publishing industry to keep their noses afloat as sales of literary fiction crash. And while that might be excusable, the fact that these are rip-off copies of an idea by one independent artist – who was then sued for copyright by Penguin only to see the publishing giant steal her idea for their own gain – leave a somewhat sour taste in the mouth. So, this Christmas, don’t pick up the latest gimmick – go for the original thing and get a copy of ‘We Go to the Gallery’ from Dung Beetle Books. Yet irrespective of the claims against it, the prize has endured. And, as the shortlist has now been announced, we here at Nothing in the Rulebook thought it would not be out of place to suggest an alternative literary list for our fine readers to contemplate. 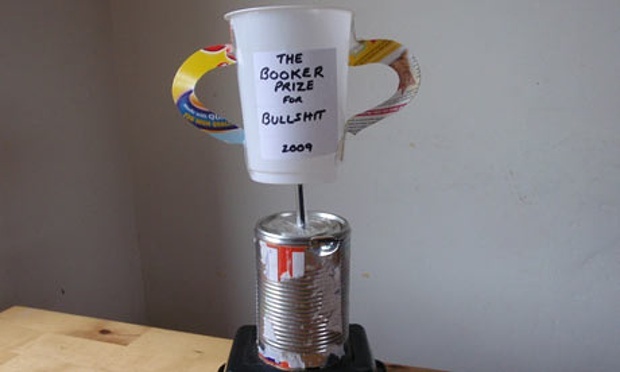 Supposedly, the Booker Prize aims to recognise the best British or Commonwealth authors. Yet here there undeniably seems to have been some bias toward the English. Despite a population of just 2.5% of the commonwealth, over half the winners of the prize have hailed from England’s shores. 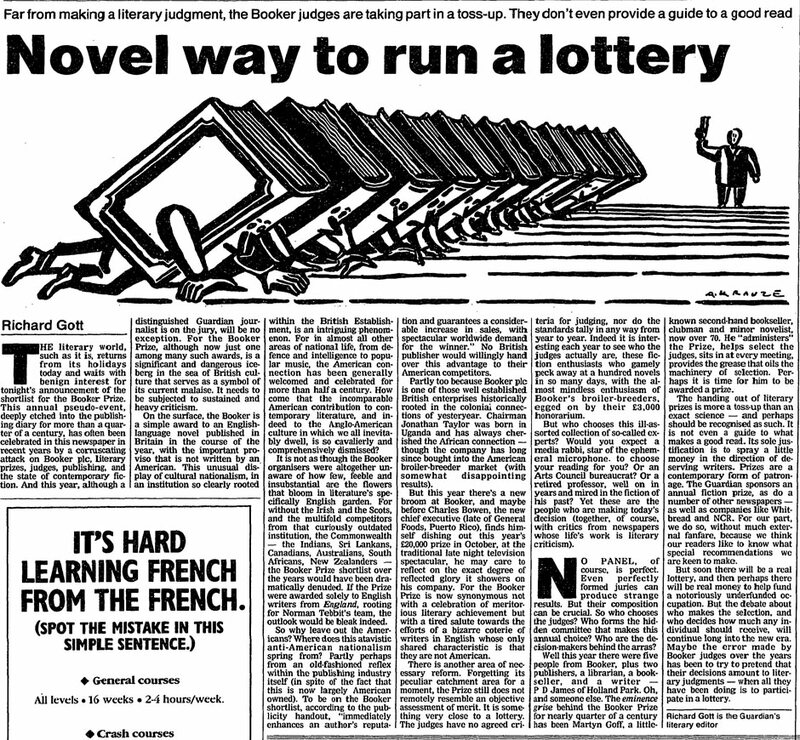 And, while there have been notable winners from former colonies, including the South African novelist J M Coetzee, it should not escape our attention that an overwhelming number of Booker judges are middle class English people, who are perhaps likely to prefer their own nation’s literature. With this in mind, we will therefore endeavour to correct this imbalance in our own shortlist. While we have no funds to actually offer the authors on this list any prize money, we can offer a potent cocktail of hopes, dreams and admiration – and that’s probably just as good. 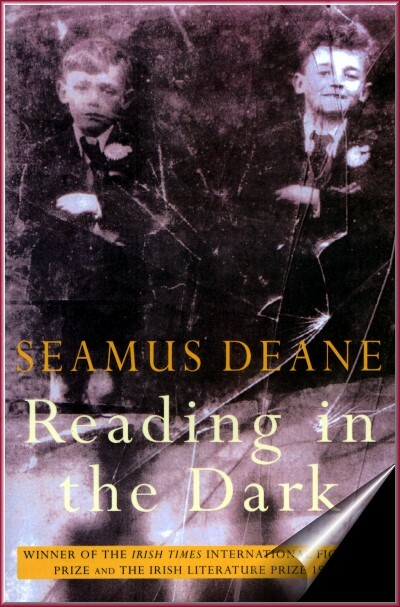 In strikingly lucid language and scenes fired by a spare, aching passion, Reading in the Dark combines the intimacy of a memoir with the suspense of a detective story. Seamus Deane’s poetic inclinations shine through in his debut novel, perfectly illuminating a coming-of-age story of an unnamed narrator in Northern Ireland. Deane captures the underlying, subconscious fears present throughout the course of the ‘troubles’ – where people live as “if they might explode any minute” and can be “disappeared”. Yet this is a pervading background to an essentially familial story, which contemplates love, religion, innocence, love and truth. And while answers to the novels questions come in bits and pieces, by the turn of the last page readers lives have been illuminated, washed in an elegant, graceful and forgiving prose. Considering two Man Booker Prize judges successfully pulled Welsh’s Trainspotting from the 1993 prize shortlist by threatening to walk out, it seemed especially apt that we list the novel here. For readers who do not come from lowland Scotland, one of the particular pleasures of this book is becoming totally immersed in the language and dialect of the novel’s characters. Ostensibly the plot follows a group of Edinburgh heroin addicts, and through its rawness, Welsh draws the reader into a world of urban depravity, Aids, drugs, and individualism – the latter an ironic homage to Thatcher’s neoliberalism, where we see in action what it’s like to live in a world where “there’s no such thing as society”. Canadian author Margaret Atwood’s dystopian classic tells the chilling tale of a concubine in an oppressive future America. 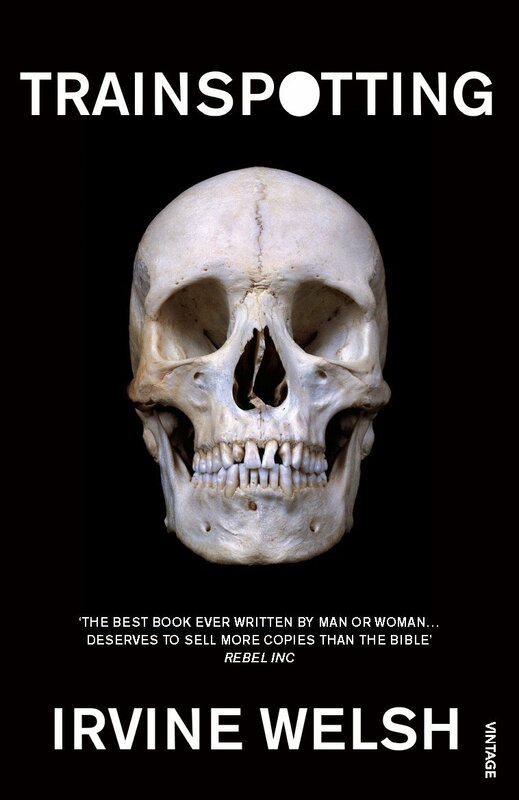 Almost 30 years since it was first published, the book is perhaps more vital than ever. 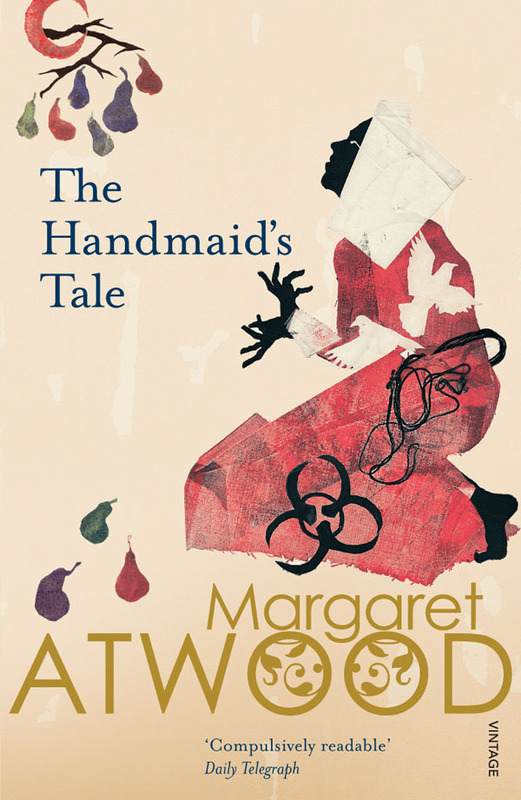 Atwood’s lyrical prose is the vehicle used to transport readers to a world where facts appear to merge into one another, and history appears immaterial. This is a fiercely political novel and, while bleak, remains both witty and wise. Arguments continue as to whether this can be classified as a work of science fiction, yet to get caught up in such debates ignores the unarguable fact that this is a truly brilliant novel by an excellent author. 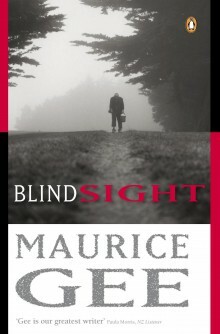 Widely acclaimed when first published, New Zealand author Maurice Gee’s Blindsight offers readers a complex but knowing portrait of siblings who were once close but are now completely estranged as adults. As the novel evolves, Gee brilliantly draws readers into the past histories of his main protagonists slowly revealing the hidden reasons Allice Ferry and her brother Gordon now live such divergent lives. Deserves to be regarded as one of the best novels published in New Zealand in the past couple of decades. Published first in 1958 – the time Britain, France and Belgium finally began to recognise the failure of colonialism and begin their unseemly withdrawal – Chinua Achebe’s debut novel concerns itself with the events surrounding the start of this disastrous chapter in African history. 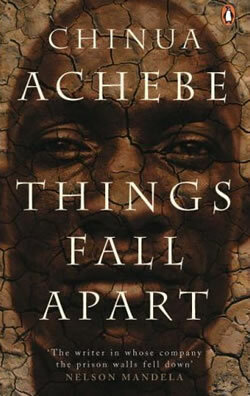 Setting the book in the late 19th Century – at the height of the “Scramble” for African territories by European powers – Achebe tells the story of Okonkwo, a proud and highly respected member of the Igbo clan. Through his eyes, we witness a village that has not changed substantially in generations become utterly transformed upon the arrival of the English. Yet it is the Bible – not the gun – that becomes the most violent weapon of choice by these “clever” white men. Set to remain on of the great novels of the colonial era, and the book that announced Achebe to the world as a most brilliant writer, it would be a disservice not to include this masterpiece on our humble list. 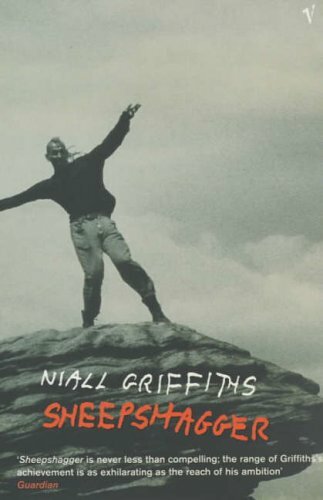 Despite being born in Liverpool, Niall Griffiths’ strong familial ties to Wales earned the dubious honorific “the Welsh Irvine Welsh” for the stunning vernacular monologues in his books ‘Grits’ and ‘Sheepshagger’. Though there are linguistic and political similarities, it’s a disservice to think of Griffiths’ book as an imitation of ‘Trainspotting’. Here we follow anti-hero Ianto – a near mute “inbred” savant with a mystical connection to nature, who divides his time between roaming the mountains of his childhood and accepting whatever drug or drink is offered by his circle of friends. As the novel progresses, we witness near Bacchanalian horrors, a distorted but nonetheless sublime depiction of the natural world, and Ianto’s ultimate downfall. It’s vivid and compelling, a modern sensibility informed by Greek tragedy and the Blakean sublime. So, there we have it. A finer shortlist of novels than you’re otherwise likely to find today. We may not have the excitement of guessing which of these great books will emerge the ultimate, victorious winner, but perhaps that doesn’t matter. After all, in a way, we’re all winners here. Because we’re the ones who get to go out and read these books and enjoy doing so, without ever having to carry out the agonising process of actually writing the damn things. Some might say such thinking is a bit of a luvvie-duvvie cop out; but nobody wants to treat writing like a competition, right?